Gill House, Clough Road, Ballinderreen, Kilcolgan. O'Donnellan & Joyce is offering for sale this wonderful five bedroom detached dormer bungalow located in Ballinderreen in south Galway. The property is ideally located within moments of Kilcolgan village just a short drive from the picturesque settings of Kinvarra. 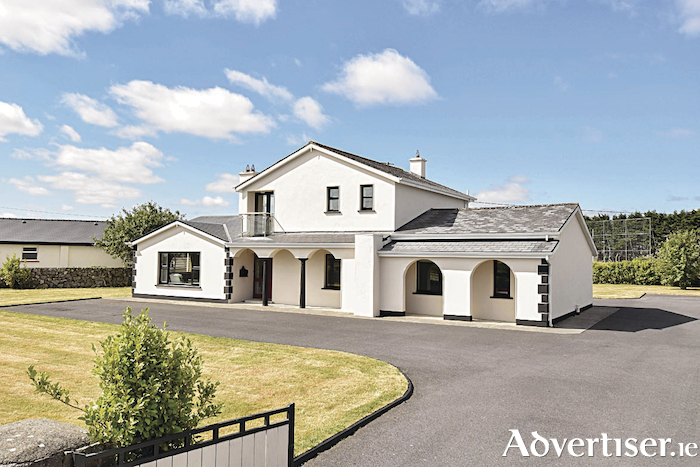 This wonderful property offers all that one would require for family living as it also conveniently located within 30 minutes of Galway city centre and 15 minutes from Oranmore. The new M6 motorway from Tuam to Limerick also makes the north and south easily accessible. This friendly neighbourhood offers many sports and recreational facilities and natural amenities such as Arran Pier, the Kinvarra area, and the surrounding Burren landscape. This spacious detached dormer bungalow at Ballinderreen is situated on a substantial 0.75 acre site in a beautiful, quiet, area and is presented in excellent condition throughout. The accommodation includes an entrance hallway, lounge room with feature fireplace, a dining room, and a kitchen with an array of solid wood units. A separate utility room, three double bedrooms with two en suites, and a main bathroom complete the accommodation on the ground floor. The first floor offers a spacious landing and a further two bedrooms. One large main family bathroom services the first floor and is beautifully appointed. Outside, the property is situated on a large private site with large gardens to the front and rear of the property. Electric gates and a wrap-around tarmacadam driveway are also on offer here. This property offers all that one would desire and mixes rural life and suburban living seamlessly for quick links to all amenities and facilities that a family would require along with the relaxing tranquillity and privacy that any family would need. Properties in this area are much sought after by many families who wish to avail of a true family home of distinction in this magnificent location. This property is one of the finest and most attractive family homes to come to the market for some time. Viewing is highly recommended and guaranteed not to disappoint. The BER is B3. Asking price is €395,000.